Sun, moon and stars – In 1832, it was not known that the stars and the sun were the same, although it had been postulated by a very few scientists in the past. Common thought (generally based on the Bible) was that they were three different types of objects. It wasn’t until 1838 that the distance to a star (Cygnus 61) was first measured. With that knowledge, its size and brightness could be calculated. It was found to be very similar to our sun. Later research using spectrography confirmed that the chemical compositions were similar and by the middle of the 19th century it was generally agreed among scientists that the sun was simply another star. Worlds without end – a misquoting of Ephesians 3:21 “world without end” meaning, simply, “eternally.” However, in current Mormon theology, “worlds without end” is taken to mean an infinite number of planets that will be ruled over by all the ‘gods’ (celestialized Mormons) where all their spirit children can get mortal bodies and learn to become gods themselves… Oh wait, we don’t still teach that, do we? Hell = Telestial Kingdom – Marie, you’re right, and Bryce, you’re right too! It’s very difficult for those of us who spent years in the Church not to interpret scripture with regard to what we’ve been taught, but to read what’s actually there. Mormon theology in 1832 did not yet have Outer Darkness as a ‘place’ where you could be sent after you were judged (that would come later [MARIE: SPOILER] when apostates would be labeled Sons of Perdition). So in 1832, you now had three ‘kingdoms’: the Telestial for ‘bad’ people, the Terrestrial for ‘good’ people who weren’t Mormons, and the Celestial for faithful Mormons. One of the criticisms of this concept was that it smacked of Universalism, which the Book of Mormon itself opposed (ooops!). 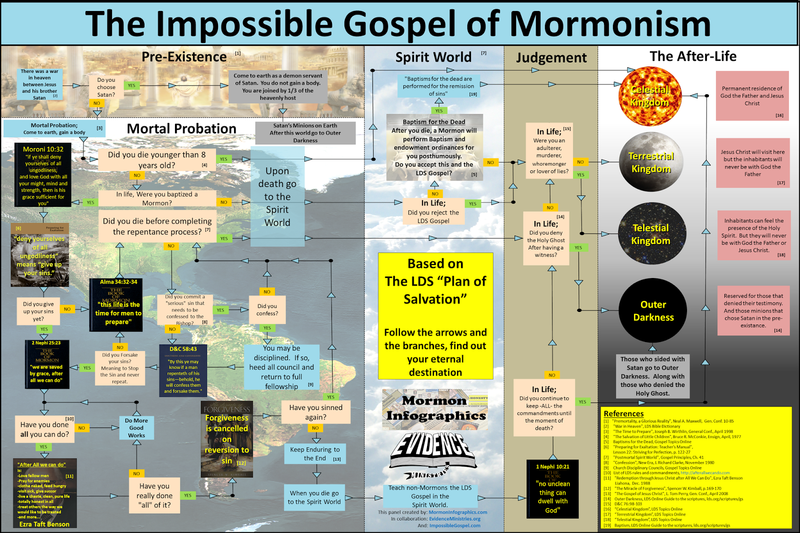 Currently, the doctrine is that when you die, you go to either Paradise (analog to the common concept of Heaven) or Spirit Prison (analog to Hell, although no fire or burning is involved – again, in direct contradiction to the Book of Mormon) [Oh, and Marie, this is where you will go initially. 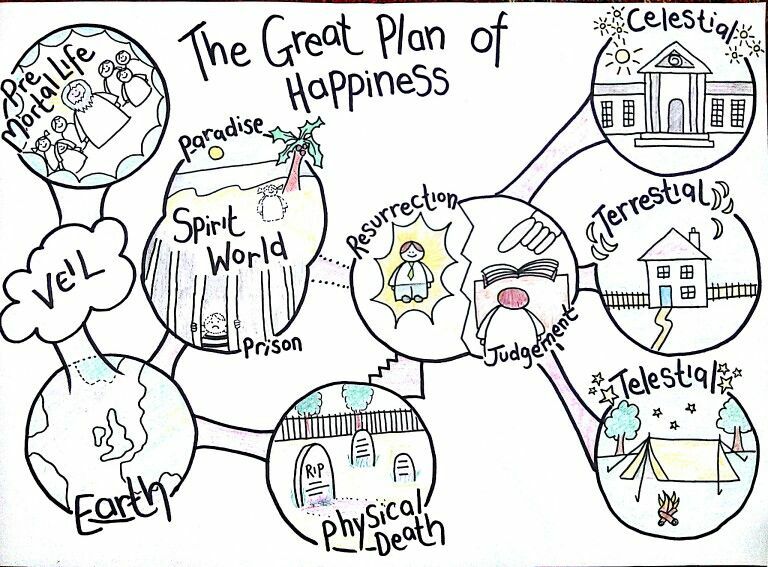 🙂 ] Those who end up in Spirit Prison will have the opportunity to have the full Gospel taught to them by missionaries from Paradise (oh no, not again!). If they then accept the Gospel (and if a Baptism for the Dead for them has been already performed in a Mormon temple), then, after the Final Judgement, they can go to the Celestial Kingdom (and get a planet to rule, etc.). Those who reject Jesus and the Holy Ghost at this point will go to Outer Darkness (along with apostates.) I could go on, but will spare you. But all of this is not what Section 76 actually says. Go figure. Let me refine my comment above by adding that is does say in v.36 that the Sons of Perdition will be cast into a lake of fire and brimstone. The last phrase of v.44 “which is their torment” is now taken to mean that their eternal guilt ‘burns like fire forever.’ This in effect ‘fixes’ the problem of a literal, burning Hell in the Book of Mormon versus the Vision of Heaven in Section 76. “J[oseph] S[mith] and Rigdon’s description of the vision outlined three levels of heavenly glory—celestial, terrestrial, and telestial—and the requirements for entrance into each. known as “sons of perdition”—would spend the afterlife in one of these “kingdoms.” These concepts differed considerably from views of the afterlife held by most Protestant churches that the souls of the “righteous” are received into heaven while the “wicked” are cast into hell. Other thinkers and theologians, however, had conceptions of heaven that were more similar to J[oseph] S[mith] and Rigdon’s vision: The Universalist church, with which J[oseph] S[mith]’s grandfather Asael Smith had affiliated, proclaimed that Christ would temporarily punish sinners but eventually redeem all people. MYSTERY SOLVED? The verses in question (91-113) are present in the earliest extant manuscript, the 1835 manuscript in Frederick G. Williams’ handwriting. They are also present in every edition of the D&C that I could find online (even the RLDS editions). I consulted Robert John Woodford’s 1974 doctoral thesis “The Historical Development of the Doctrine and Covenants” (available at archive.org). He traces numerous variations between the different editions and reprints in Church newspapers, but there is no indication that those verses were ever intentionally absent. So that leads me to believe that possibly Joel’s source text could be faulty. This could be due to a missing printing plate when he book was printed, a missing page from the book itself, a bad scan of the book when digitized, or some other reason. I haven’t been able to locate an 1844 edition to consult, so that’s where I’ll leave things for now. I want both your brain and your research skeelz. I messaged Joel about it! I figured out my mistake. In the original text I had from josephsmithpapers.org, there were page number notations like [p. 229] in the text. In my cleanup script, where I removed those, I used the regular expression /\[p.+\]/. Essentially this says “look for anything that starts with ‘[p’ along with anything else until you find a ‘]’. This works if there’s only one page notation. However, verse 7 is long enough that it spanned more than a full page. Thus, the “anything else” included everything between the first opening bracket of “[p. 229]” and the close bracket of “[p. 230]”. This is called a “greedy” regular expression because it tries to find as much text as possible to match. It was easily fixed by changing it to a non-greedy expression by changing it to /\[p.+?\]/. So, totally my fault. I saw it immediately when I looked at that code. Oh yeah, OK, uh huh, sure. Piece of cake. 😉 Seriously, Joel, to the non-programmers among us, it’s amazing what you’ve done. Many thanks for providing us with this tool. Bryce mentioned that some prophet once said that the Telestial Kingdom was so glorious that you’d kill yourself to get there. This is attributed to Joseph Smith, but if he did say it, we don’t have a direct quote, that I’m aware of. Whether Eldred Smith had that Charles Walker statement in mind, or was privy to other information, I don’t know. I assume a lot of people in my parents’ generation would have heard that little tidbit from the BYU address, and passed it on like a game of telephone, and that’s why we hear this kind of thing all the time today, but still no one knows for sure if and when Joseph Smith said it. The concept of going to Spirit Paradise or Spirit Prison prior to the resurrection was something elucidated in the Book of Mormon, in Alma chapter 40. It’s hard to say whether Joseph Smith even cared what was in the Book of Mormon after he wrote it, as he hardly ever used it in his later teachings. Maybe D&C 76 was meant to completely supplant the Book of Mormon’s afterlife doctrine, rather than supplement it. Still, the modern LDS doctrine tries to meld it all together. And the relatively few Sons of Perdition get no kingdom of glory, and end up in Outer Darkness, the permanent Hell, with Satan and his angels. Likewise, in LDS doctrine, sometimes Heaven refers to the pre-mortal existence, sometimes to any and all kingdoms of glory, sometimes to just the Celestial Kingdom, and sometimes to something even more exclusive than general citizenship in the Celestial Kingdom, as will be explained later in the D&C. 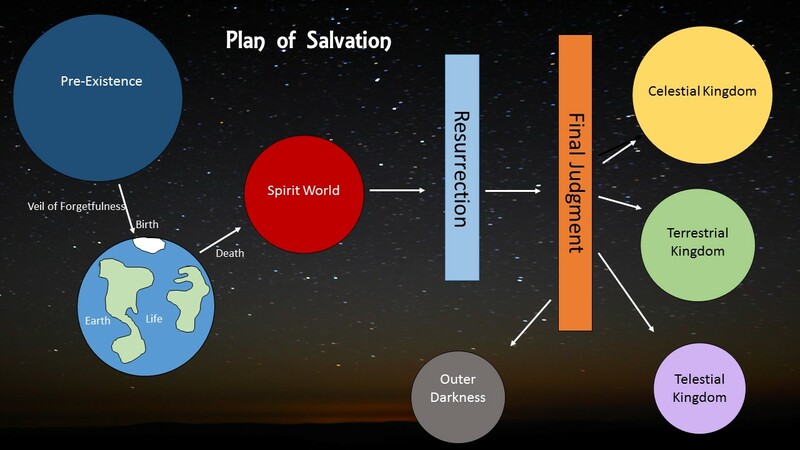 Since no one has had the full D&C 76 experience until they’ve seen it in diagram form, I give you various depictions of the Plan of Salvation, none of which was produced or officially authorized by the LDS church, I should point out. First, here’s a pretty basic version someone whipped up to teach young kids, with some cute illustrations. I particularly like the different facial expressions on the sun, moon, and stars. The sun is super happy, the moon is pretty contented, I guess, and the star is a little bemused, not in anguish, or anything, but apparently unsure of how to feel about how things have turned out. Next we have a similarly juvenile diagram, which adds a few elements. 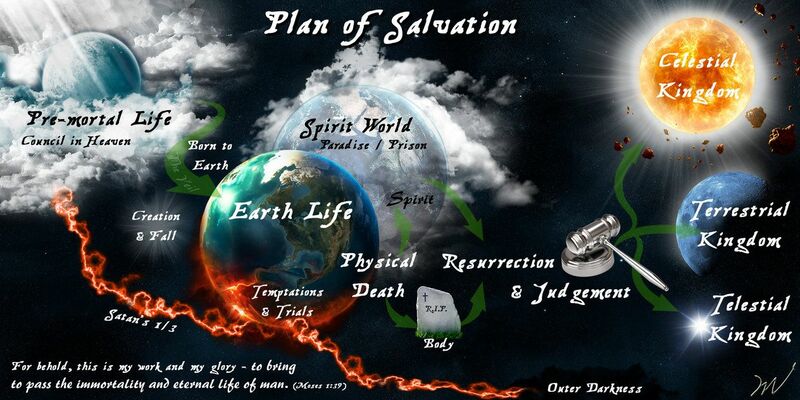 This version shows the division of the Spirit World into Paradise and Prison, and also depicts your body moldering in the ground while your spirit is hanging out, either on the spirit beach, or behind spirit bars. We also see a notable feature, the “VEIL”. At birth, God places a veil over every person’s mind, doncha know, to block out our memories of pre-mortal life, and even our very perception of the spiritual realm, so as to make mortal life a proper closed-book final exam. Here’s a more basic version, the kind you might see on the blackboard in youth Sunday School every now and then, which reminds everyone there is also an Outer Darkness to worry about. Lastly, I give you a version with no distracting word labels, not meant to teach anyone anything, but merely designed to make a quick buck in the Mormon art market, and isn’t that the most important thing, in the end? It can’t possibly be the Nexus from Generations. Everyone knows that being in it is like being wrapped in blanket of joy. But aside from that nerdtastic reference, those diagrams are exceedingly helpful. I’m absolutely going to be directing people to look at them here when Bryce and I discussed The Comments Section next week. Thank you! Wait. I’m confused. 50+ years in the church and I never noticed. If the terrestrial kingdom is for those who die without the law, then why do we spend so much effort providing saving ordinances for the dead? If everyone will eventually have the opportunity to accept or reject the gospel (or law), doesn’t that imply celestial by accepting or telestial by rejecting? You hit the nail on the head, Angie! When you patch together all Joseph Smith’s many ideas about the afterlife and salvation for the dead, it leaves this rather gaping plot hole. I spent a lot of time as a believer trying to work this out, and never came to a good conclusion. 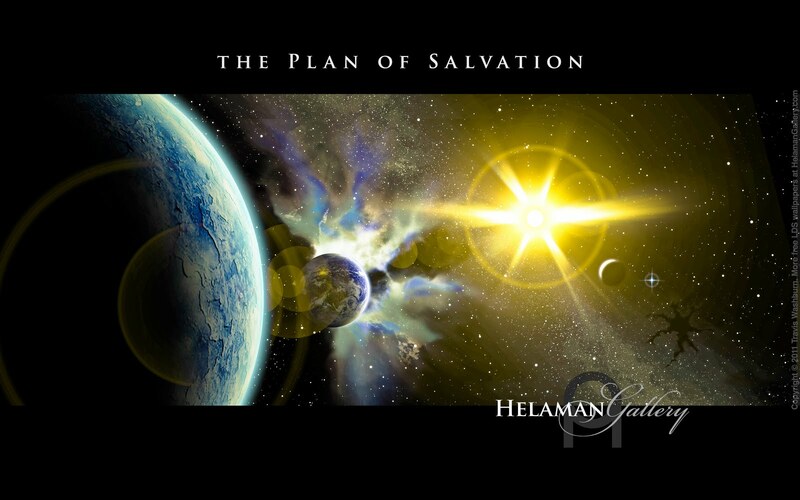 The closest I ever got was to suppose that the only way into the Celestial Kingdom is to accept the gospel while you’re in the same “sphere” of existence (if I may allude to the cute spheres in the various Plan of Salvation diagrams) in which you learned it. So, if you are fully ignorant of Mormonism in life, no matter your sins, if you embrace it in the Spirit World, and get baptized for the dead, you’re Celestial material. If you reject Mormonism in the Spirit World, and only accept it after the resurrection, at which time you’ve received back a perfect knowledge of everything, including the pre-existence, and there’s no real test of faith anymore, then you’re only worthy to be Telestial. Or maybe that’s only if you’re a liar, magician, or whoremonger, to boot? But if you knew sufficiently about Mormonism in life that you could have accepted it then, but didn’t, and only accepted it in the Spirit World, yet still lived an otherwise good, non-whoremongering life, you’ll still only achieve the Terrestrial Kingdom. Even if you were baptized for the dead, it doesn’t make a difference. Members of the church would perform the baptism for the dead anyway, I guess, because only God can judge whether you really got a fair chance to accept Mormonism in life or not, and they’re hoping you were just ignorant enough before you died for your after-deathbed repentance to count, and get you into the Celestial Kingdom? But how then would Terrestrial Kingdom people be considered “they who died without law” if they did know something about it? There’s the snag. I tried to make sense of it, but it’s still an inconsistent mess. I could never get a consistent answer regarding the afterlife in the Baptist tradition, either. It was super clear that if you knew about Jesus/God and rejected His teachings that you would spend eternity in hell, full stop. However, what about kids who die before they can understand Christianity? What about people who hear about it, and have a traumatic brain injury before they can decide what to do? People who never hear about Christianity? I got different answers from different religious authority figures! Then I made the mistake (okay, maybe not a mistake) of reading the Bible. Nope, couldn’t find a clear answer there either. A major side effect of recording D&C 76 and the Patron Bonus episode about what I was taught about heaven and hell as a proto-teenageer is that I feel significantly less stressed about the afterlife. I’d been pondering “What if I’m wrong about religion and the afterlife?” ever since I left religion. Now? Nothing can be proven! Inconsistency abounds. I’m not worried at all. Wowie McZowie! I’ve seen the chart from 1950 before, but I didn’t realize anyone had ever committed this much detail to print. When I was a child, Mormon heaven as described by my grandparents, never really sounded like anywhere I’d want to go. When I was nine I couldn’t make up my mind whether to hope for heaven or hope for oblivion. It looks like the only thing that’s eternal is bureaucracy. I should have guessed.